Dwyfor’s keen recyclers deliver a green Xmas present for Gwynedd residents | News by Wales Express News, People Before Profit! New waste collection arrangements recently introduced to 15,000 homes in the Dwyfor area are already delivering significant reductions to the amount of waste Gwynedd Council sends to be buried in landfill sites. Gwynedd Council’s Environment Cabinet Member, Councillor Gareth Roberts. 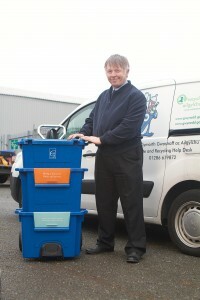 By supporting the council’s weekly recycling and food waste collections, Dwyfor residents are playing their part in helping the council to reach its goal of making Gwynedd the most environmentally friendly county in Wales whilst saving the Gwynedd taxpayer tens of thousands of pounds at a time when the council must bridge an unprecedented £50 million funding shortfall between now and 2017/18. – The amount of food waste collected in Dwyfor as part of the weekly food waste collection (brown bin) increased from 56 tonnes in November 2013 to 71 tonnes in November 2014. Thanks to this effort, the amount of waste that is recycled or composted for the whole of Gwynedd has increased from 54% in March 2014 to 57.2% in November 2014. As a result, with similar changes set to be rolled out to homes in the Meirionnydd and Arfon areas in 2015, Gwynedd is now well placed to hit the Welsh Government’s expectation that all Welsh councils recycle at least 58% of the waste they collect by March 2016 and then 64% by 2020. In addition, it is forecast that the changes introduced to the 15,000 households in Dwyfor alone will result in a financial saving of around £100,000 for Gwynedd Council in landfill charges and other costs associated with burying waste in the ground that could easily be recycled or composted. Gwynedd Council’s Environment Cabinet Member, Councillor Gareth Roberts said: “By backing the new arrangements and making good use of the weekly recycling and food waste collections, the people of Dwyfor have delivered an early Christmas present for our environment and for the Gwynedd Council taxpayer. “As a Council we are extremely grateful to the people of Dwyfor for positively embracing this change. The fact that so many Dwyfor people were already keen recyclers before the change, means that this further increase in recycling and food waste rates is something for which they can all be justifiably proud. “We are also pleased that the hard work that went into ensuring a smooth and efficient transition has paid off. This effort included listening and responding positively to the feedback presented by over 2,500 local people to a residents survey held back in the spring by for example putting in place special weekly arrangements to collect nappies from households with young children; sending detailed information packs explaining the changes to every Dwyfor household and undertaking our biggest ever social media campaign to get the message across to thousands of Facebook and Twitter users in Dwyfor. “In addition, since mid-October a close eye has been kept on the feedback, comments and complaints received via the Council’s Galw Gwynedd call centre. By doing so we could see that the number of complaints or concerns received has been minimal and that any teething problems were being tackled promptly and efficiently. “As well as the obvious environmental arguments, the financial arguments for pressing ahead are also truly compelling at this time of unprecedented pressure on the public purse. “We estimate that the changes introduced in Dwyfor – an area with 15,000 households – will save the Gwynedd taxpayer around £100,000 a year. If the 19,000 households in Meirionnydd and the 26,000 households in Arfon follow where Dwyfor has led in 2015, this annual saving will shoot up to around £414,000 for the whole of Gwynedd.